Efforts to alleviate poverty have traditionally concentrated on strategies to increase the incomeof lower-income households through employment and training, tax policy and income redistribution. Recently, policymakers, academics and practitioners have recognized the importanceof enabling poor families to build assets if they are ever to reach self-sufficiency. Although obviously related to income, asset development has additional long-term financial and social benefits. As a result of this recent emphasis on asset development, several new programs have been developed, most notably Individual Development Accounts (IDA) that match the savings of lower-income people for homeownership, business development, or education expenses. 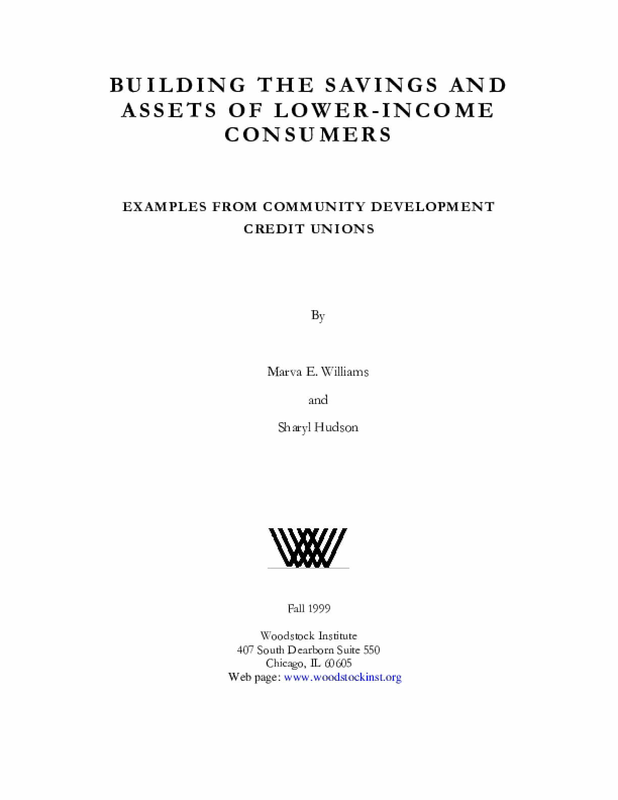 However, very little has been written about the long-term efforts of community development credit unions(CDCUs), which have a long history of formal and informal strategies to increase the financial literacy of their members, encourage thrift, support savings and enable the accumulation of personal assets. A grant from the National Credit Union Foundation allowed us to examine the asset development programs and activities of five CDCUs. Central Appalachian Peoples Federal Credit Union, Quitman County Federal Credit Union, Northeast Community Federal Credit Union, Progressive Neighborhood Federal Credit Union, and Zion United Credit Union illustrate the wide diversity of strategies that empower lower-income people to develop assets. These efforts rangefrom promoting homeownership to supporting financial literacy among youth, to providing a 'last chance' for consumers who have damaged credit reports, to working with the special needs ofimmigrants and refugees. It is our hope that this report will encourage other community development finance institutions, banks, and community development corporations to developsimilar programs that help to bring lower-income people into the financial mainstream.